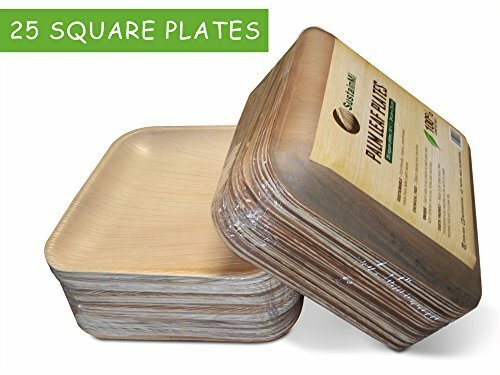 DISPOSABLE PALM LEAF PLATES. Compostable. 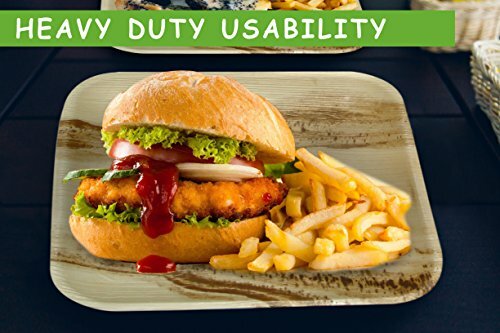 Superior to Bamboo, Plastic, Paper or Wooden Plates. Great for Weddings, Dinner Parties, BBQ's. Eco Friendly, Organic & Sustainable. Microwave & Oven-Safe. 9.5" x 9.5" x 4.5" Square Plates. 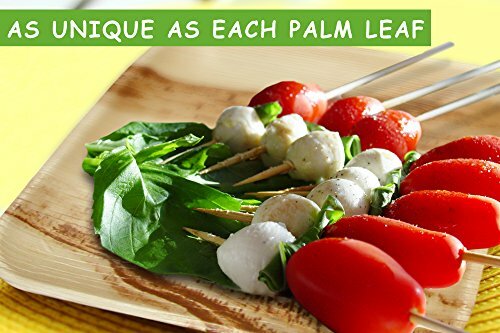 Bring life to your party with Palm Leaf Plates by SustainMi, the Premier Brand of Compostable Palm Leaf Plates! 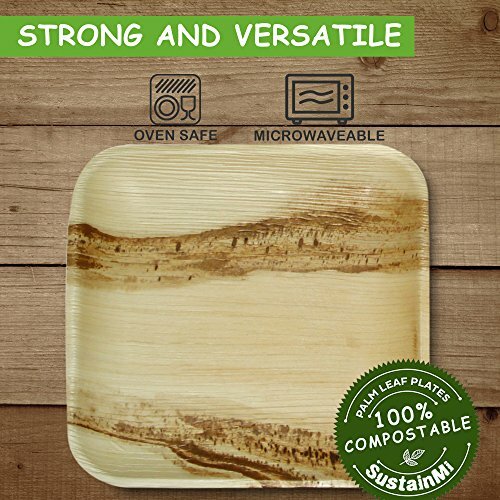 Entertain responsibly with SustainMi, 100% Compostable, Palm Leaf Plates. 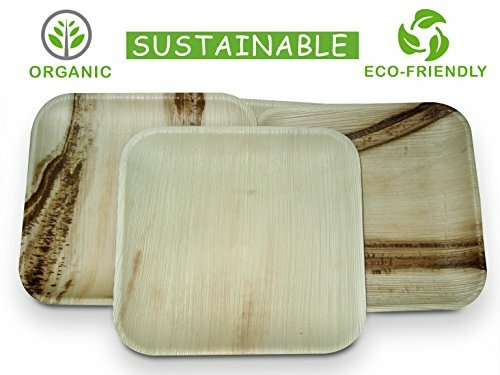 The most beautiful and unique, compostable and disposable plate you have ever seen! These deluxe palm leaf plates will provide exceptional elegance for all of your party guests and will bring life to your next occasion and many occasions to come. BONUS E-BOOK "The Green Shopper" included. ★★ EXTRA STURDY - Superior construction and thickness, allowing for no leaks or collapsing. 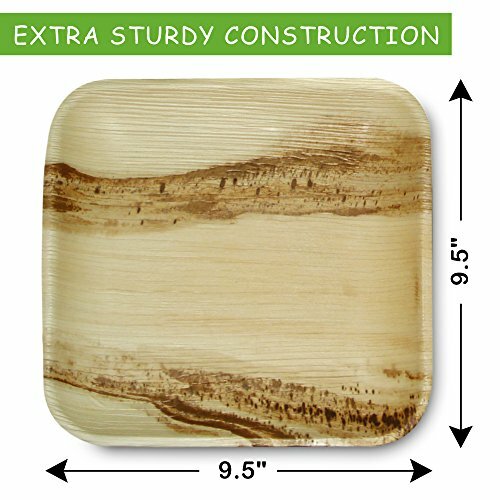 ★★ ECO FRIENDLY - Made from 100% fallen palm leaves. Organic, compostable and sustainable. ★★ MULTIPURPOSE & DISPOSABLE - Perfect for indoor and outdoor parties, bbq's, weddings and celebrations ★★ MICROWAVE & OVEN SAFE - Chemical-free, microwaveable & oven-safe to 350 degrees for up to 10 minutes. ★★ 100% MONEY-BACK GUARANTEE - We guarantee that you will be fully satisfied with your purchase or you will receive your money back. No hassles, no worries.